Today’s tutorial is all about how to frost a smooth cake. Getting that nice, smooth finish when icing a cake can take some practice, but I have been asked so many times about how I get my icing so smooth, I’ve finally put together some instructions that I hope will be helpful. Just remember you have to be patient. My first cake did not look like my current cakes. It took practice – and the right tools. See my post on how to beautifully frost your cupcakes! Let’s talk about that icing smoother for a second. I linked to it above, but it’s an Ateco smoother that costs less than $5. It is the best money I have ever spent on a tool. I used to use another one, but it was big and clunky and I had no idea how much it hindered my ability to get a nice, smooth cake until I tried this one. It’s lightweight, small and easy to use. In addition to those tools, you’ll obviously need a cake and some icing. I used regular American Buttercream (recipe here). For my cakes that are about this size, I go through about 2 1/2 recipes worth. For this tutorial, I started with a cake that was already crumb coated and had a layer of icing on the top of the cake. 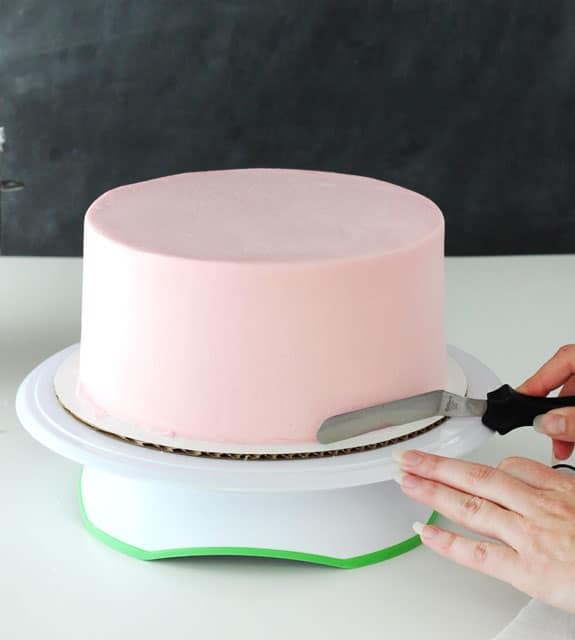 It’s important to already have the top layer on the cake and get it as smooth as you can with your offset spatula. It’ll get further smoothed later, but it’s best to have it smooth now too. The crumb coat isn’t entirely necessary for every cake. 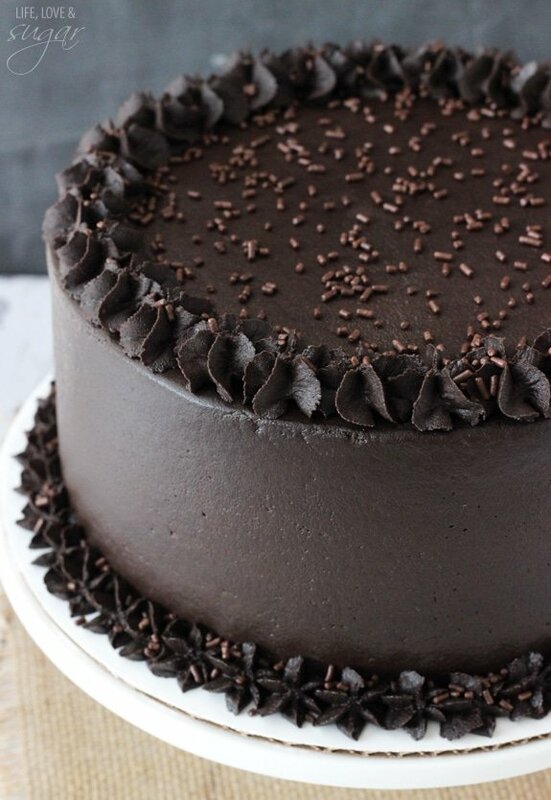 Typically chocolate cakes are more likely to need them, since they tend to have more crumbs. But because of the way I add my icing, it’s not always necessary. I use an icing tip and bag, which reduces crumbs mixing into the icing. So to get started from here, you’ll want your icing bag fitted with the Wilton #789 icing tip and filled with icing. Starting from the bottom of the cake, pipe icing around the edge, trying to keep even pressure on the bag so that the layer of icing is even. You’ll have multiple layers of piped icing, depending on the height of your cake. The top layer needs to stick above the top edge of the cake. This will be important later for smoothing the top edges/corners of the cake. When you are done applying the icing to the sides of the cake, it’s time to smooth it. This is where the icing smoother comes in. Place it against the side of the cake. You want to hold it straight up and down, as straight as possible. 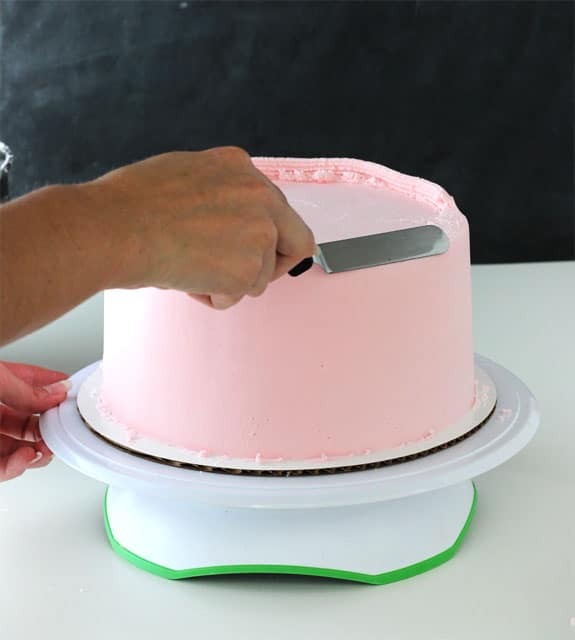 Hold your icing smoother in the same place and use your other hand to turn the turntable. Continue to turn the turntable, scraping the icing off of the smoother occasionally so that there isn’t too much buildup. 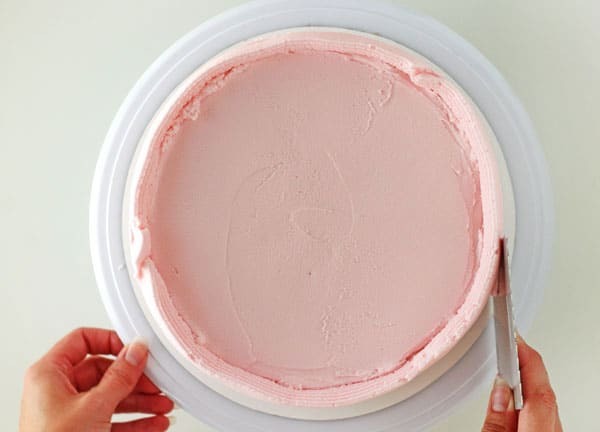 I clean off my smoother regularly and when I scrape the excess icing off of it, I usually also wipe it with a paper towel, so that there isn’t anything left on there that will mess up the icing once I place it back on the side of the cake. Here is an image showing the angle at which I hold the smoother. I really believe the angle makes a big difference in the way the icing smooths. Do not hold it at 90 degrees. The tighter the angle (like shown), the better the excess icing pulls around the cake and fills in gaps. After doing a few turns of the turntable, you’ll notice some gaps that are deeper and should probably be filled in. I usually notice it at the “seems” where the three layers of icing were piped on. 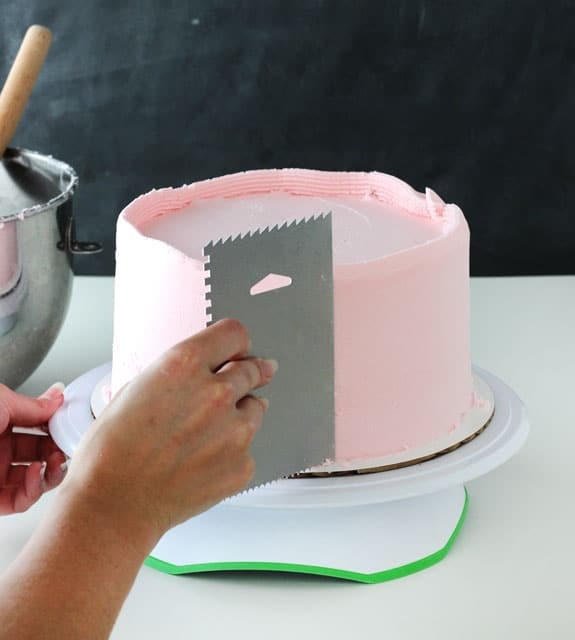 At this point, use your offset spatula to add some icing to the gaps. You’ll want to have a little excess icing, rather than too little. Begin smoothing the sides again, pulling the excess icing around the cake to fill in gaps, then wiping off the icing smoother as needed. 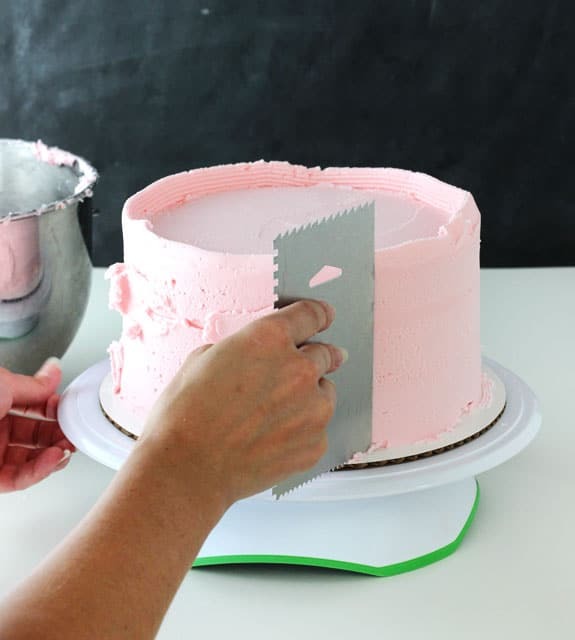 Continue working around the outside of the cake, pulling the icing, then scraping it off of the icing smoother. You can fill in more gaps if needed, just keep working the sides until you are happy with it. You should end up with a cake that looks like this. The sides are mostly smooth and the excess icing from the top is still sticking up above the cake. In some places you may have tiny little holes from the air in the icing. The angle that you hold the icing smoother can make a difference in how many of those you end up with. Again, tighter angle is better. Also, some of those will fill in as we smooth the sides again later with a paper towel. Next is always the scariest part! The top edges/corners. It was even harder to do these while taking photos. 🙂 The whole icing process took longer than normal, so my icing started to crust a bit and so it’s a little drier in the photos than yours should be at this point. You want to work as quickly as you can. If the icing starts to crust, it’s harder to work with. 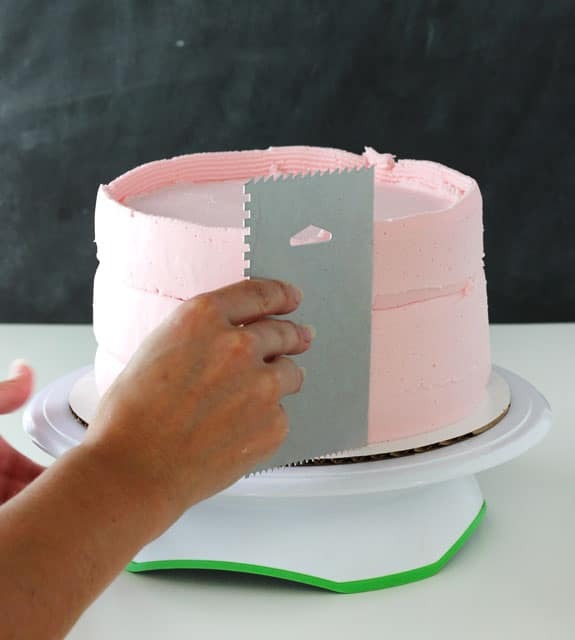 To do the edges, you can use the icing smoother or the offset spatula. I use either, depending on my mood, though often I do feel like the offset spatula gives me more control. Pull the icing in towards the middle of the cake, making the corner level with the top of the cake. The spatula should be at about a 45 degree angle. The excess icing should help fill in any uneven-ness on those top corners as you pull it in. 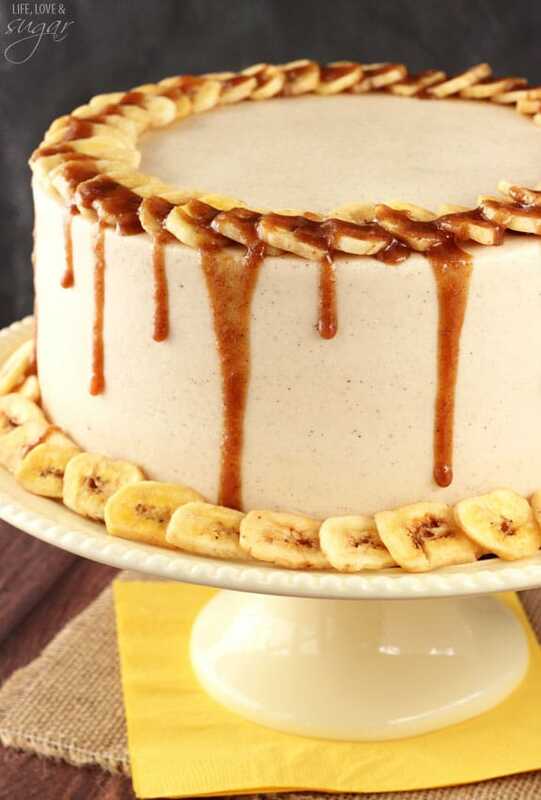 Go all the way around the cake, until it looks like the one below. Again, my icing is a bit drier than yours should be. Hopefully, your cake top is a bit smoother. 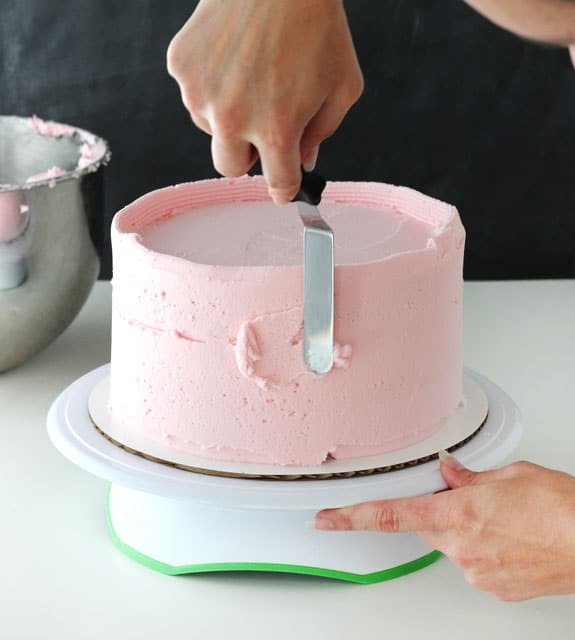 Use your offset spatula to continue to work the icing on the top of the cake and smooth the top edges. Do not mess with the sides or side part of the corners yet. Just try to get the top as smooth as you can, the sides should already be smooth. Next, we use the paper towel to finish smoothing any imperfections that are left from the offset spatula. Like I said above, I ONLY use Viva paper towels for this. They are the only paper towel I know of that doesn’t have raised patterns on it. You’ll notice that one side is smoother than the other – that’s the side you want against the cake. I usually start with the top of the cake, since it tends to be rougher and need more work. Along with your paper towel, you’ll need the fondant smoother. 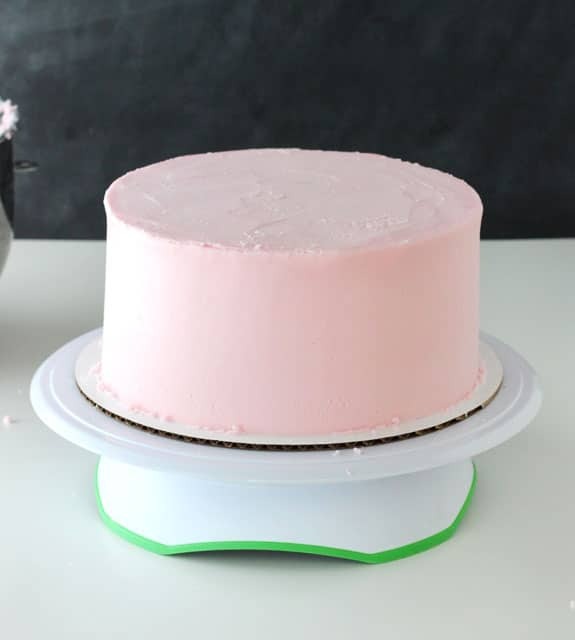 Place the paper towel on the cake, smoothest side down, and rub in small circular motions with the fondant smoother to smooth out the icing. Press firmly and evenly, but not hard. Do the same with the sides of the cake, evening out any bumps or air holes. 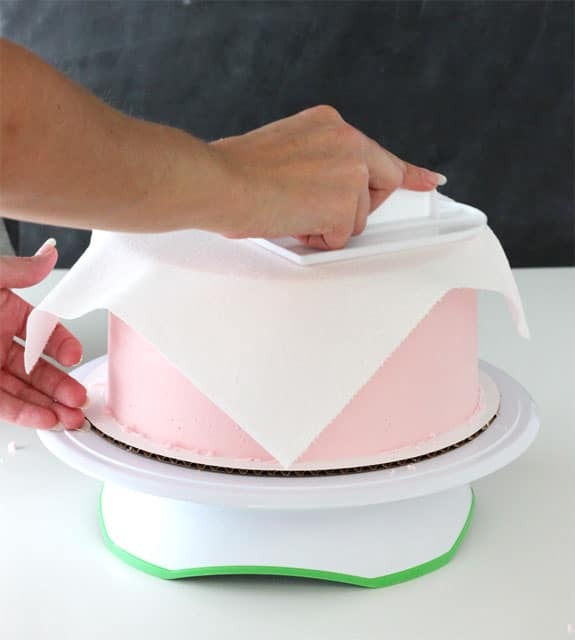 To help make sharper corners, place the paper towel on the top of cake, letting it hang over the edge and down the side. 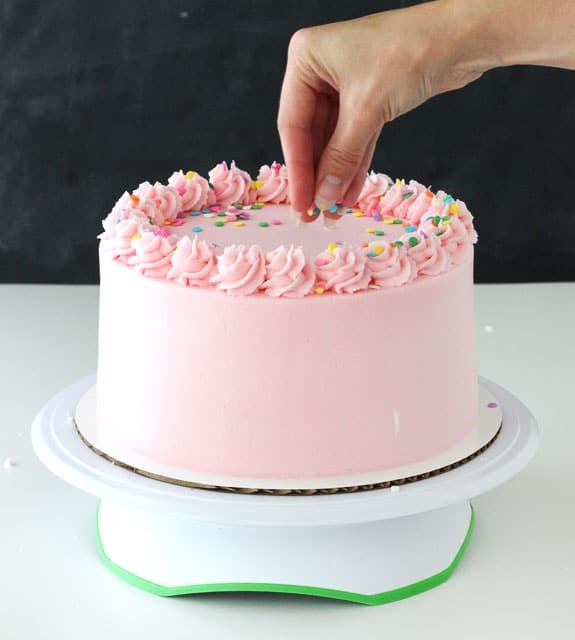 Placing your fingers against the side of the cake to keep the icing in place, use the fondant smoother to gently push the icing out towards to edge to help make that corner sharp. Do that anywhere you think the edges could use it. 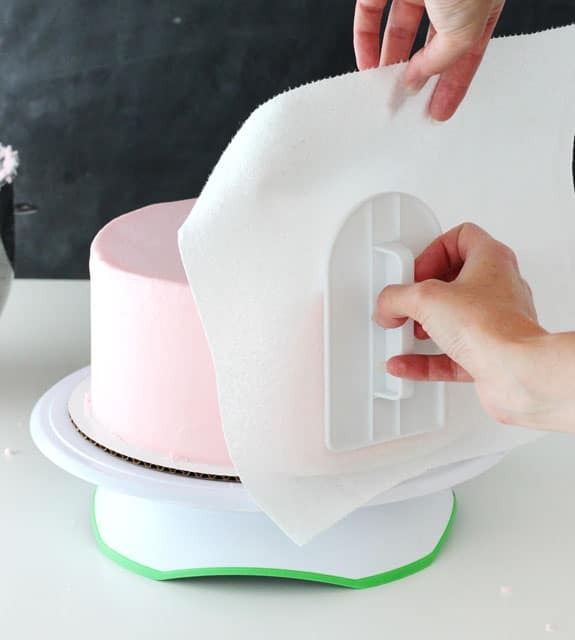 Keep working that paper towel and fondant smoother until you are happy with your cake. Next, I like to take my offset spatula and remove excess icing at the bottom of the cake and give it a clean edge. 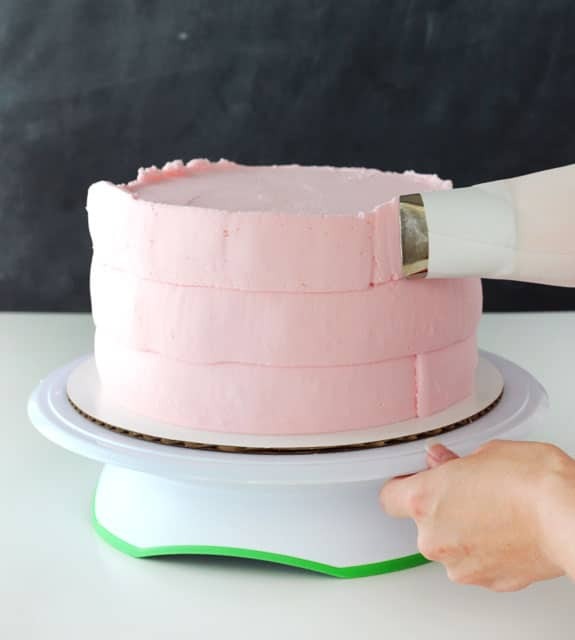 The spatula is placed at an angle so that nothing is actually touching the side of the cake, but just the bottom of the spatula side is grabbing the excess icing. Then pull the excess towards you and away from the cake. Use your other icing tip to pipe on your border. I used Ateco tip 844, but you could also use Wilton 1M, which is similar, or any other tip you prefer. *Update* For some help with getting the right frosting consistency, check out my new post on how I like to do it. UPDATE 8/4/16: Here’s a video showing the technique on a recent cake! I am completely in love with this tutorial, Lindsay! I’ve taken a lot of decorating classes, but I’m not anywhere near as good as you. Your pics and instructions are so clear and helpful! 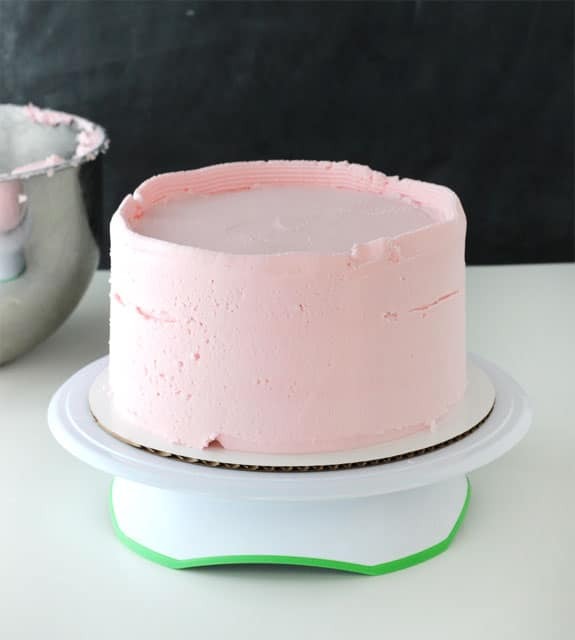 This is a great tutorial and I now have Ateco icing smoothers in my Amazon shopping cart! Thanks for sharing! Wonderful! I’m glad it was helpful! Thanks Martha! Thank you so much. Excellent tutorial. Thank you SO much for this tutorial. Your descriptions and pictures make everything easier to understand. I had heard of the Viva papertowel thing before but wasn’t sure (until now) how exactly to make this technique work. I’m so glad it’s helpful! Thanks Jenifer! Thank you for this tutorial! I have had no idea how to frost a cake properly till know! My goodness, this is one of the best tutorials I’ve ever seen. The careful explanations and many photos are so much more helpful than just do this, then it should look like this, then you’re done. I like that you give the reasons WHY you do things a certain way as it is clear you’ve had a ton of experience and have worked out the best methods through practice. Stunning cake. Bravo. It should be fine with 3 layers of cake. I have many like that on the blog. The method should work for most any size cake, it’s just a little trickier to execute at a large size. Beautiful post, Lindsay!! Your gifs are great. WOW! Lindsay, this is fantastic! 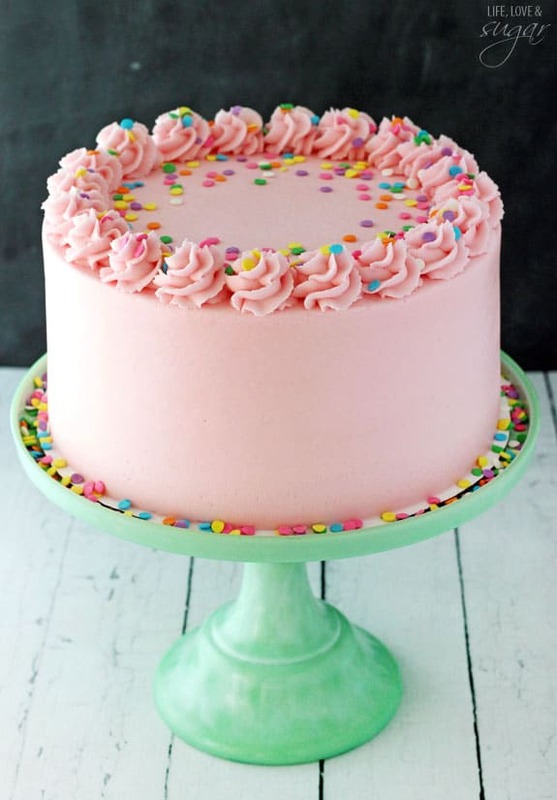 I just learnt so much – I didn’t know you should put the icing on the top first or that you could use a tip like that to pipe on the icing OR that you could smooth it over with a fondant smoother and a paper towel. I will be referring to this tutorial often! Thank you so much! Awesome! I’m glad you found it so helpful! Thanks Jessica! I just bought one of everything Lindsay! This is AWESOME! Now I want to bake a cake 🙂 Pinned! Awesome Trish! 🙂 Glad it was helpful! 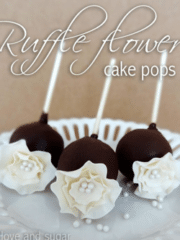 Love this post…you do always have the smoothest looking cakes! 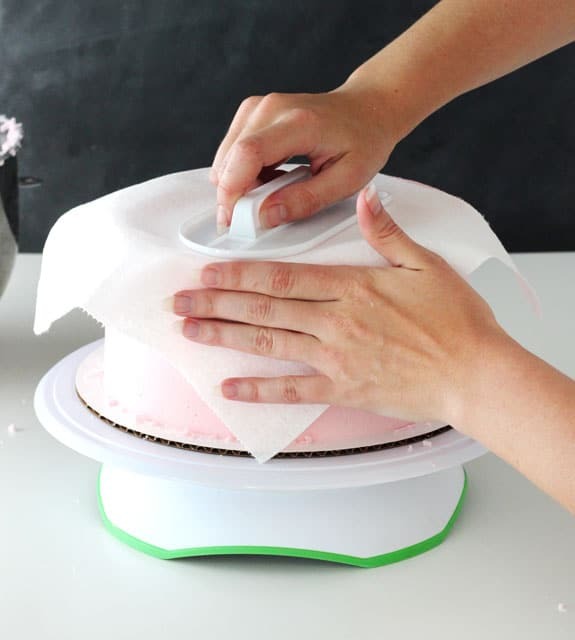 I use paper towels to smooth out my cakes too, but I never though to use a fondant smoother over the paper towels. I’m definitely getting one of those before I do another cake. Hi Alma! I checked the links and they appear to correct. Thanks Rachel! The paper towels won’t stick to a crusting buttercream, like the one I use (linked in the post). They probably would stick to a sticky icing though. This is the problem I had. My paper towel lifted the icing when I removed it. What should I have done differently. Should I have left the iced cake to sit for longer before smoothing? or is it the type of buttercream I had? I used half the amount of butter to icing sugar. If I can figure out what went wrong I’ll definitely try this tutorial again as I’m desperate to master smooth sides and strong edges. No, you don’t want to let the cake sit – the buttercream will crust and then crack when you try to mess with it again. The issue would be frosting consistency. If it’s too thin, it will stick to the paper towel. Here’s a tutorial I put together to help with getting the right consistency. I hope it helps! 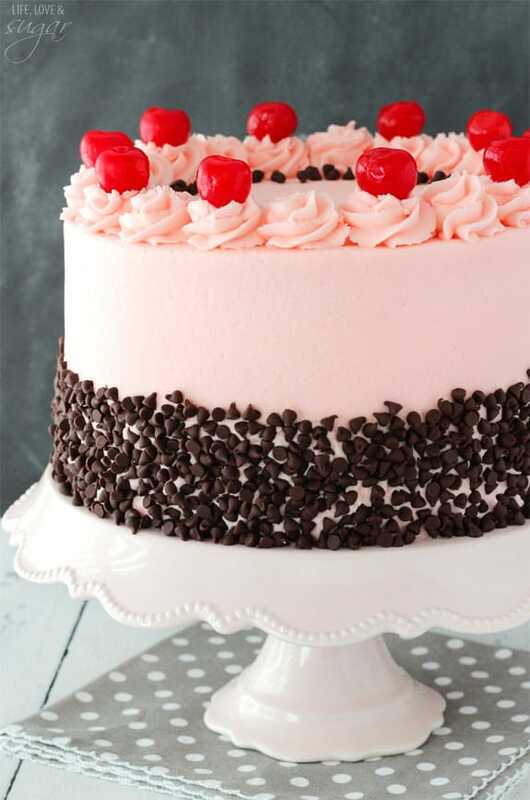 I was so jealous when I saw how smooth your cherry chip cake was! Thank you for the tutorial! I had no idea so much was involved. I literally thought you scooped the icing on with spoons and smoothed it down with one spatula. Or maybe that’s just how I do it when I cook boxed cakes and use canned icing. Awesome job sister… it looks great! when you apply the paper towel, How do you get the frosting to not come off on the paper towel? That’s dependent on the frosting you use. 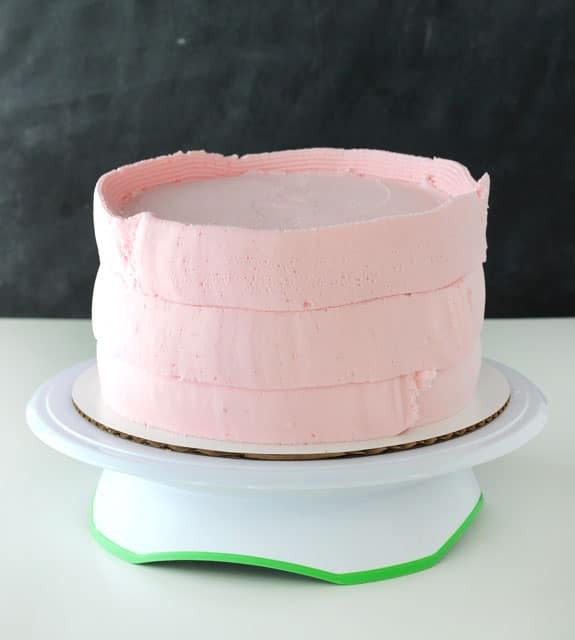 The one that I linked to up near the top of the tutorial is called a crusting buttercream, which is ideal for this method of smoothing a cake and using a paper towel. If you don’t use a crusting buttercream, then yes, the paper towel will likely stick. What a great tutorial….thank you!! Your cakes are always gorgeous. Thank you Joanna! I hope you find it helpful! Can I double or triple icing recipe? Yes, all according to how much frosting you need. A great resource- lovely pictures and easy to follow. Thank you! This tutorial is amazing! Thank you SO much for taking the time to share your tips and tricks. I’ve ordered some of the tools you recommended, and I’m ready to give it a try! Your cakes are always inspiring, Lindsay! After cutting the crowns off I freeze my layers for a couple of hours and then I don’t get crumbs. I was wondering do you ever get air bubbles under the frosting. This happened to me and I am not sure why. P.S. Your cakes look fantastic. Yes, I do! I hate that! I don’t know exactly how it happens, but it usually is the result of air trapped in the cake that builds up pressure until it releases. It’s hard to say how to completely avoid them, but when they happen, I use my paper towel and smoother to try and get the icing back into place and smooth. Amazing Tutorial!! I´m in love with the result. But I have a question. Do I have to wait a little between the last smoothing and the Paper Towel Step? For the icing get dry? I’m glad the tutorial is helpful! I don’t usually wait for the icing to dry. Reason being that once the buttercream has crusted, it’s hard to actually smooth any imperfections out. If the icing is too wet, you could wait a few minutes, but not too long. Also, if the the icing is too wet, you might want to reduce the amount of liquid next time. Was also curious if you had any cake storing tips (to keep the cake moist and happy between servings)? Thanks Amir! I’m glad you find this tutorial helpful. As for storing, I typically leave my cakes at room temperature unless there is a filling that needs refrigeration. I think they stay more moist that way. I usually just store mine in a cake carrier. Love this tutorial. You explained it all so perfectly! Thank you!! Hello. Wonderful tutorial. My question is how does the paper towel not stick to the cake? Every time i have tried this it sticks and pulls off my frosting. ideas? Hmm, have you looked at my buttercream recipe? I’m not sure if it’s the one you use or not, but I’m guessing the amount of liquid in the frosting is probably the culprit. The paper towel method doesn’t work on a frosting that’s really moist. You are insanely talented! 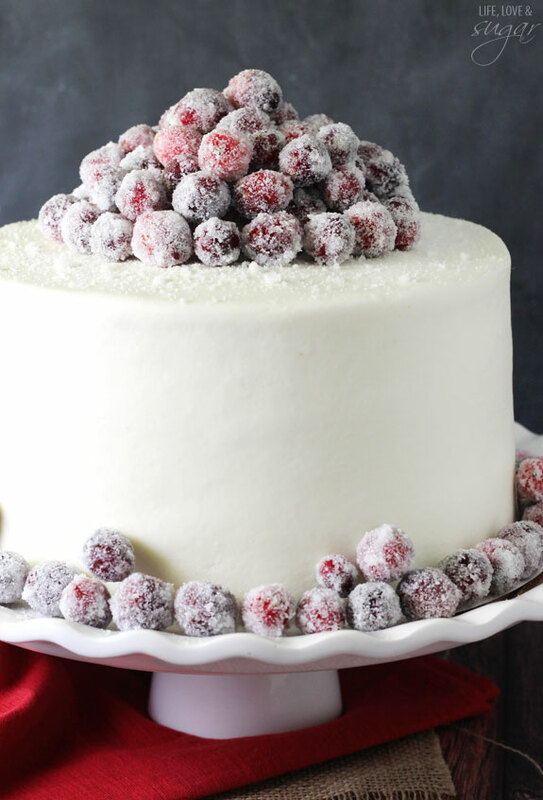 The thought of trying to ice a cake like that is really daunting… however your tutorial is awesome! I’m going to give it a try! Awesome tutorial! Thanks for including links for the tools you used! So helpful! Hi Lindsay! This isn’t really a comment- I didn’t know how to contact you. I just started reblogging after a long break and I made a cake utilizing your method. I have received some good feedback on it on IG and will be posting it on my blog. I would like to to put a link in my blog to send them to your page since I used your method/tools. I think your post was so well done that it inspired me to try it and I’d like to share it with my friends! I would be happy to send you a pic of the cake if you would like to review. Thanks! Have a great holiday! Hi Kim! I’m so glad you found the tutorial helpful. I’d love for you to share it by linking back to me for the instructions – thank you! You are a skilled woman. Will be back to your blog again and again. My house is filled with the lovely smell of the chocolate cakes from the Turtle Cake recipe. My friend is going to love this for her birthday cake. I am looking forward to trying your icing techniques. Great work! Thank you very much for helpful comment. You’re great! really nice and helpful , but can i use something else ,like baking paper ,as i do not live in america and i can’t use the Viva paper towels , as not found where i live and i looked around and can’t find any smooth paper towels ,all the brands have paten , only the blue paper towel used on the kitchens restaurants or cafe do not have ant paten buy they blue and i am afraid not good enough or maybe the colour will transfer . Thank you and good luck with all you do. You could try baking paper, but just be careful to not wrinkle it or that will transfer to the cake. What kind of frosting is this that your paper towel doesn’t stick to the frosting is there a trick there? I link to the recipe above, but here is the link as well. I talk a good bit about the recipe in that post. I have alwaysed loved your frosting on your cakes! I am so glad you created this tutorial. I have used wax paper similarly to the paper towel. But there is a chance of wrinkles with the wax. I am going to try this method soon! Thanks Chandra! Yes, I’d think wax paper could give wrinkles. The paper towels are great! This is a beautiful cake and I appreciate your step by step tutorial with photos. I do have one question and it’s how do you avoid frosting sticking to the paper towel? Did the cake go into the the refrigerator for a bit? No, I don’t refrigerate the cake. The buttercream is a crusting buttercream, so you actually need to use the paper towel right away. I linked to the buttercream recipe I use in the post above. Not all frostings will work with the paper towel. Thank you Nancy! I’m so glad you found the blog too. 🙂 I hope you give it a try! That’s so much for an amazing tutorial I’m so excited to try! I’m new to trying my own decorated cakes so is it best to freeze for a short time before icing it? Thanks so much! I read a lot of tutorials that talk about refrigerating cakes first. Unless my cake has a filling that is supposed to be refrigerated and I want it to firm up before frosting (like a lemon curd), I don’t refrigerate or freeze it first. If you try it though and find that refrigerating helps, you certainly can. These cakes look so exquisite and the frosting is like art. I love making cakes and I consider my mixes to be super delicious. When it comes to frosting though, that is an art I have yet to perfect! 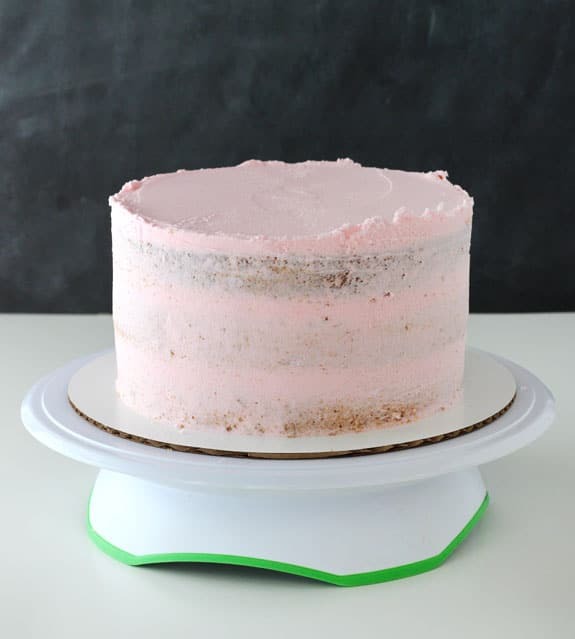 My cake stand actually has a non-slide surface, but if yours is sliding around a great trick is to use the stuff that helps rugs not slip around on a hardwood floor. I use them all the time when transporting cakes and desserts to keep them from sliding around the car. Just cut it into small pieces. A small piece will work wonders. 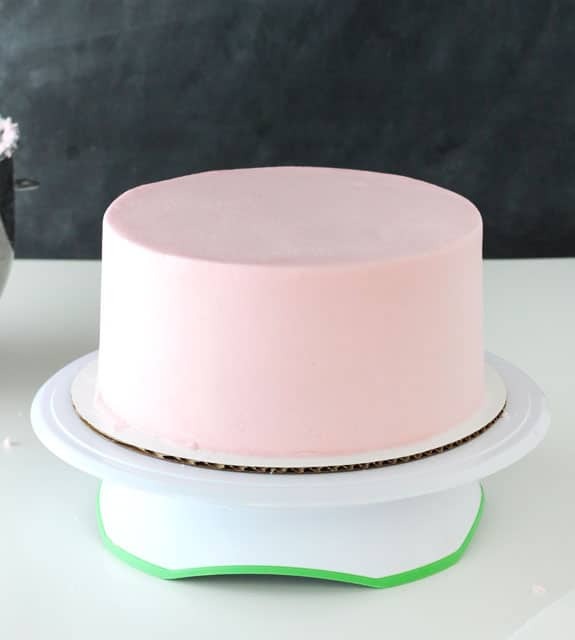 As for transferring the frosted cake to a stand, I frost cakes on cardboard cake circles. 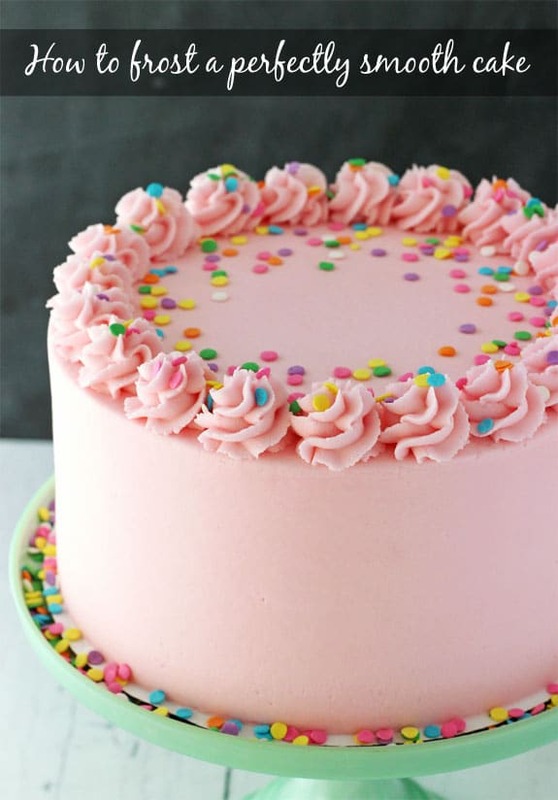 If you look in these photos of the cake on the stand, you can see it underneath the sprinkles. I trim it down so that it fits within the stand. I hope that helps! Thanks! I’ve used the Viva alone and it workedpretty well but it is so great to see your steps prior to the Viva. One little question though. What size piping bag are you using? I just fussed at myself for buying so much baking stuff but here I go again! Thanks for the great directions! It’s a 16 inch bag I believe. I’ve already tried it once and my cake looked 150% better already. Love your site! I’m so glad to hear it’s helping!! Thanks Chris! This may be a silly question, but I’m not the biggest fan of fondant but I want the same look. So I was thinking instead of doing fondant over the entire cake I would try doing your smooth buttercream frosting tutorial, but then I got to thinking, would you still be able to stick fondant decorations onto the sides of the cake without the icing peeling away? For some reason I just get this horrible vision of doing all this work just to see it fall apart haha. Thanks again for your great tutorial! 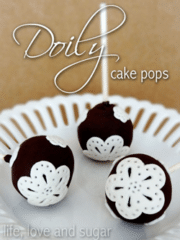 Yes, you can still add fondant decorations. I use a sugar water made by dissolving some fondant in a little bit of water. Then I use a brush to add the sugar water to the fondant decoration (making it sticky) and press it lightly onto the cake. As long as they aren’t really big or heavy decorations, they should be fine. I tried this method the other week. The icing stuck to the paper towel. I did not use your recipe, but my own buttercream recipe that does crust. Is there a magic time I should wait before putting the paper towel to avoid it from sticking to the paper towel? Without knowing much about your buttercream, I’m going to guess it has to do with how much liquid you use in the frosting. I make mine quite thick so that it doesn’t stick. When I tap my finger up against the frosting in the bowl (when I’m mixing it), just a little bit will stick to my finger rather than a bunch sticking. I’m so glad you found the tutorial helpful! Though I have a little question, because my original language is Dutch, and I don't understand what "shortening" means. I tried to search on www, but I do'nt seem to find it here. Can you please give me some brands, that I can ask in our stores if they know something similar? This is the one I use. If you don’t have it available in your area, all butter frosting would be the way to go. I realise this thread is a few months old, only just found your blog. I’ve been baking cakes for 25 years and have only used an offset spatula, will now give your paper towel and buttercream recipe a go. In response to Virginie: the Crisco brand is sold by some Jumbo stores. Shortening is bakvet, een plantaardige olie. I am Dutch myself and find living in Australia, I have to adapt Dutch recipes to the ingredients I can source here. Good luck with your baking. Can you use Wilton Parchment paper work instead on paper towels? I find that parchment paper gets wrinkles in it that would actually not work well. Have you tried this with a cream cheese frosting? Half cream cheese/half butter? Would like to use this technique for my daughters cake this weekend. Yes, I have. Depending on how thick your cream cheese frosting is, the paper towel may stick. The rest of the method will work fine. This is such a beautiful cake! I just ordered all of your recommended products so I can hopefully attempt to make this! I will be doing a two-tier cake (9” and 6”) and will need to tweak the instructions to accomodate the second tier. My instinct tells me I should frost them both separately, then very, very carefully place the 6” tier on top, secure with a dowel, then re-smooth the top. What do you think? Your instincts seem to be right on. 🙂 I’d frost them separately then add the smaller one to the top. muy agradecida por compartir estas deliciosas recetas.pronto empezare a practicarlas para iniciar mi negocio propio. me encanta todo sobre reposteria .y se que con sus aportes lo podre lograr. miles de bendiciones. Wao ! Tnx for sharing have just gotten another knowledge about the application of egg using only white & using viva paper to get a very smooth work. Nice tutorial. I live in india . I am not sure if I could get this paper towel brand ( Viva). Does this technique work for whipped cream also? One question. Should we freeze the cake before we smoothen out with paper towel and smoothener. will the cream not stick if we dont refrigerate? Everything but the paper towel would work with whipped cream. I don’t freeze the cake first. It’s really more about the consistency of the frosting. If it’s too thin and sticky, it’ll stick to the paper towel. Thank you very much for the tutorial. I have just ordered all the accessories. I would like to make the vanilla buttercream frosting in pink as you have done. What do you add to the original recipe to make it pink? Have I missed something? I looked on your blog at other frostings and they added chopped strawberries or raspberries. Is that what you have done here? I live in Spain and cannot get the Viva paper or any other make without patterns. Any other suggestions about what I could use instead? I’m glad you found it helpful! You can use icing gel color to color the frosting. As for another kind of paper towel, I’m not sure of another option. You should still be able to get it pretty smooth though without it. This is the best tutorial I’ve seen! Thank you for giving out so many tips! Awesome! 🙂 Thanks so much Susan! I hope it’s helpful! Can you please explain what the crumb coating is that you started off with at the beginning of the directions? I’ve heard of this before but when I try to google it all I get is cakes covered with crumbs. 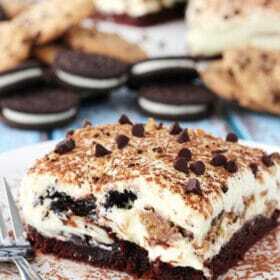 Like, on purpose – “Crush oreo cookies and sprinkle over the top to coat it with crumbs.” Ummmm don’t think so! It’s really just an initial thin layer of frosting. It’s called a “crumb” coat because it typically is used to keep all the crumbs in place so that when you add a final layer of frosting, you don’t have crumbs showing. Why doesn’t the frosting stick to the paper towel? It’s all about the consistency of the frosting. If it’s too thin, it will stick to the paper towel. Just wanted to say THANK YOU Lindsay!! I decided to make my 3 year olds birthday cake for the first time as I realllly didn’t want to pay $$$ for it. I followed the tutorial step by step and it turned out fantastic (including your recipe for strawberry and vanilla frosting)! This was my first attempt at a buttercream cake as well, so I could not have accomplished it without your guidance! Happy New Year to you! Wonderful! I’m so glad to hear it was helpful! Thanks so much Dani! 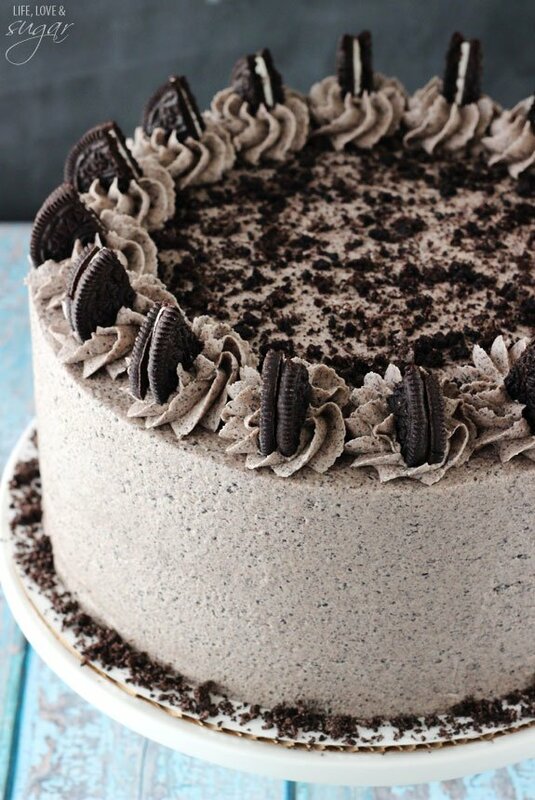 I want to make this cake, but if i crumb coat it the night before, wouldn’t the remaining frosting dry out? How could you tackle this problem? I love your cakes by the way, they look so proffesional! The frosting on the cake will definitely crust. It might be ok if it’s refrigerated. Also, if you’re using the same method of adding the frosting with the piping tips, it might be ok. Just re mix the frosting a bit to soften things up again. I can’t thank you enough for such a detailed tutorial! Any chance you could do one in getting a smooth buttercream top on a sugar cookie? I can’t seem to ever get mine smooth without using royal icing. Hmm, I’ve never tried or seen cookies with smooth buttercream I don’t think. I’ll have to do a little looking around. 🙂 I’m glad you enjoyed the tutorial! HI Lindsay, I love your tutorial about using the paper towel and I even have started using your buttercream recipe! I like the texture of it with half of it being shortening. However, I tried the paper towel method with it, and it keeps sticking. The icing is not crusting. I put the cake in the fridge for a few minutes hoping this would help and it crusted, but still stuck to the paper towel after a couple minutes of working with it. Do you have any advice? Thank you! It sounds like the frosting is a little thin, so it’s sticking. To test the consistency of frosting for the paper towel method, I tap it with my finger when it’s in the mixing bowl. I want it to stick to my finger a little bit, but not too much. If it sticks really easily, it’ll likely stick to a cupcake. If it doesn’t stick to my finger at all, it’ll be too thick for spreading. I hope that helps! I have followed your tutorials and have tried this method on two cakes with your buttercream recipe as well. It worked very well on the first, but on the second, I struggled with still being able to kind of “see” the cake layers through the icing. I wasn’t seeing the actual layers, but more of the shape of each layer and the filling between them, which really distracted from the smoothness of the cake. I’m thinking that I might be piping too little icing on the sides, and that us what is causing it. Do you have any suggestions? Also, I have been leveling my cake layers to the point that they look great with a crumb coat, but when I add the rest of the icing, they end up leaning a bit, or tilted. Any recommendations to keep my cakes straighter? Thank you for all your yummy recipes! Your blog is one of my favorites! Hi Sidney! 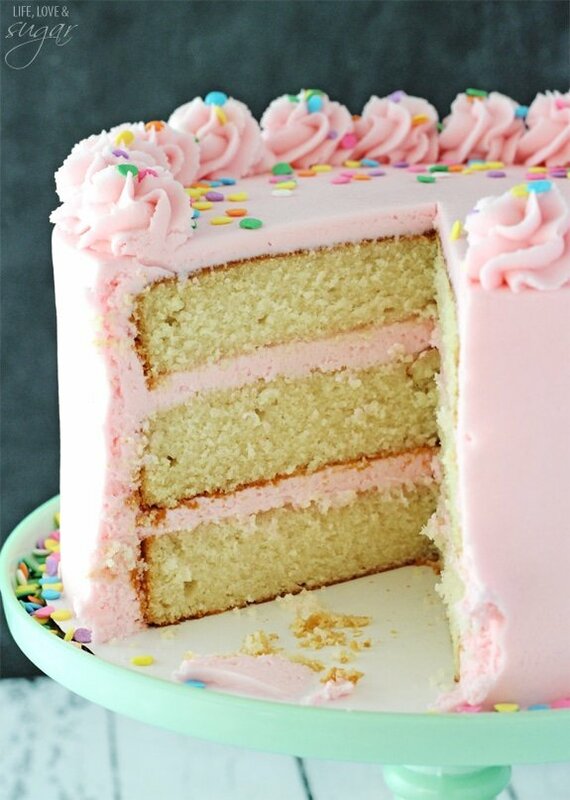 Do you know if it’s the frosting kind of squeezing out from between the cake layers that you’re seeing? It’s possible that it’s not the thickness of the layer of frosting on the outside of the cake, but the consistency (thickness) of the frosting itself. I’ve had a couple questions lately related to the consistency of the frosting, so I’m thinking that might be my next tutorial. 🙂 In your case though, it sounds like the frosting might be a bit thin for the cake layers. I tend to use a thicker frosting than some people so that it doesn’t smoosh out when the cake is stacked. Does that sound like what’s happening? The leaning cake issue could also be from the same issue of the frosting moving around after you stack the cake because it’s thin. I’m not sure. I followed your advice on checking consistency by how much sticks to your finger. I made your raspberry almond layer cake, and the raspberry buttercream was thinner than the normal buttercream and the almond that covered the cake. So that might have been part of the problem. But I do think I might still be piping it on too thin around the outside. A tutorial on consistency would be great! Thanks! Sorry to respond twice! I did notice that the cake felt very sturdy and straight, the layers weren’t sliding at all, until I put the icing on top of the cake and started doing the sides, then it started oozing a bit. I wonder if I put too much on top of the cake? Hi lindsay thank u for sharing ur decorating method. By the way, doesnt the paper towel stick to the frosting at all? Or tear as u lift it up from the frosting? I am in Australia and i dont know if theres viva paper towel here so im just thinking to get the strongest paper towel with a smooth side. You want to make sure to have the right consistency frosting so that the paper towel doesn’t stick. Since I’ve received several questions about that, I’m currently working on an addition to this tutorial to talk about that. I am having trouble after my cake has been completely decorated and finished with it cracking. Especially on the a 9×13. After I pick it up and move it it wants to crack. Any tips on how to avoid this? That can happen with a crusting buttercream because of the “crust”. You just have to be careful with it. I’m so excited to try this technique! What size of cake pan did you use here? I’m not sure if should do an 8″ or 9″ layer cake. 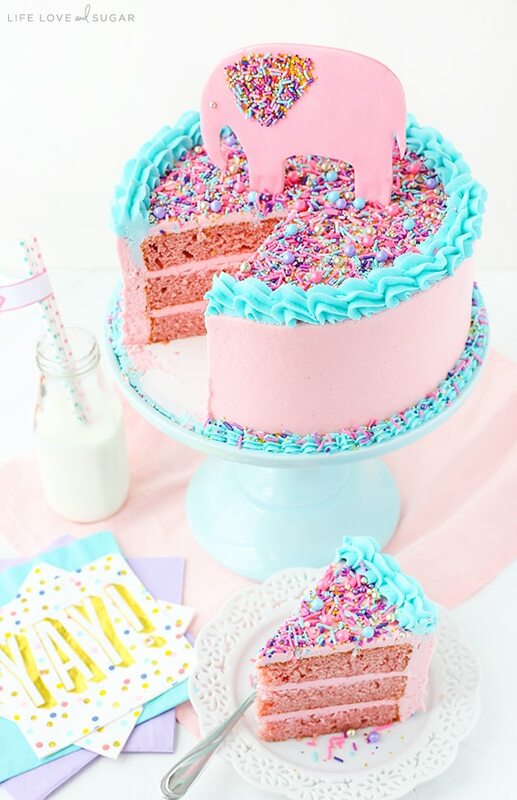 I want to make a 4 layer unicorn cake for my daughter’s birthday. Do you think it would sag using a dense cake? Should i do a thicker 3 layer or a thinner 4 layer? By far the best frosting tutorial on the net. A million thanks for sharing your technique. I’m in Canada and not sure if we have Viva paper towels here. If I can’t get them is there anything else that works? Parchment paper?? It’s hard for me to know what other options might exist in other places, you know? I don’t know of an alternative here in the U.S. unfortunately. Parchment paper is too stiff and will get wrinkles in it, but you could try. I’m sorry! :(. I stumbled across your post and followed all your directions. At first my three layer strawberry cake looked really nice… (smooth and tall) But then it started to collapse and looked more like a donut (w/o the hole) with rounded sides I tried pushing it back together, I tried adding more frosting I made from recipe (1/2 butter/ 1/2 shortening version) and also tried removing some with the icing smoother. I don’t have a lot of experience but feel that something I did went wrong. Do you think it’s the weight of the icing when the cake is very light and spongy? I’m just trying to figure out where I went wrong!! Did you have a filling between the layers, or just frosting? It sounds like whatever was between the cake layers was too thin and started seeping out. If it was a filling, you need to have a good sturdy dam of frosting around the outside edge to keep the filling in place. If it was just a frosting, it sounds like it was too thin. I used store bought Betty Crocker vanilla cream frosting between the layers, thin layer on top, and also as my crumb guard around the sides. Then I used the homemade icing on top of that . Do you think that it was too thin? I know everyone likes a true buttercream and my homemade version tasted more like cookie dough according to my 14-year-old daughter. So I use both kinds. She said it certainly didn’t taste bad, it just tasted different than traditional buttercream. Do you think this was my problem? Great tutorial!! Just wondering, does it have to be a paper towel? We don’t have Viva here in Montreal, Canada. Do you think parchment paper or waxed paper would work? I’m not sure of something other than Viva paper towels that works well. Parchment and wax paper will likely crinkle and put lines into the sides of the cake. What an awesome tutorial ???????????????????? So detailed n well written Thank you so much for sharing it, I can’t wait to try it. Oh my goodness!!!! Thank you so much for this tutorial! I HATE fondant, the flavor and texture. Definitely trying this out tonight. Thanks so much Laura! Glad you found it helpful! I enjoyed your tips on icing a cake. I am wondering why you use a paper towel and not a piece of parchment paper. Parchment paper tends to wrinkle for me, but you could try it. I have never decorated a cake before but would say all around I’m a pretty crafty gal. I did some research before starting and came across your blog. I used your vanilla frosting recipe and this tutorial. This was so helpful. I love the way the cakes turned out. Thanks! Oh my gosh! This is my first time commenting on a tutorial and I’m doing so because this was awesome! I was totally engaged from the starting to the ending instructions. You made this feel so effortless for a beginner like me; I thank you! I’m glad to hear it! Thanks Luciana! I found this so helpful. I wonder if you would consider doing a video showing how you level the cakes. Yours are so perfectly level before frosting. Thank you! I usually use Russian piping tips for frosting such big cakes. Btw I like your tutorials a lot. I learned many good techniques. Thanks for that. I love the look of your site. I agree that you need a great go to vanilla cake. I have been looking for one. I am trying out the cupcakes. They are in the oven and smell wonderful. I also like your icing tutorial. I have tried and tried techniques for smoothing a cake, but always fail. When trying this method with using the paper towel…. the icing is always lifted with the paper towel when I go to remove it. SOS!!!!! Hi Lindsay! Your site is so helpful that I bought a few more stuffs like yours such as the cake icer and smoother. It made my life easier with decorating cakes! Quick question though, I rarely use buttercream as I find them too sweet so I always opt for frostings with cream cheese , mascarpone or whipping cream. Will this smoothing technique work with these kinds of frostings that I use? Thanks in advance! I’m glad you find it helpful Tessa! This technique probably won’t be great with those other types of frosting because of the way it would stick to the paper towel. Everything else will be fine, but the paper towel smoothing won’t be successful. It’s a buttercream, not royal icing. So good instruction. Thanks. Can i use other tools for frosting? 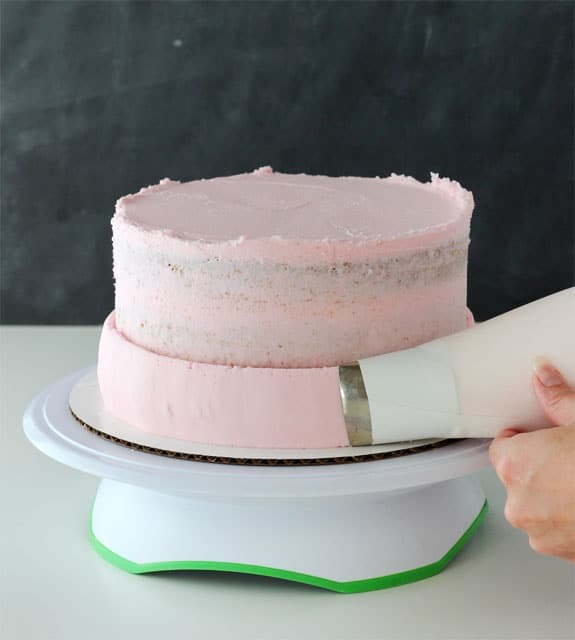 please tell some simple tools for frosting…. I’m so glad you’ve enjoyed the blog and tutorial! Cream cheese frosting is a little more tricky because it is usually sticky from the cream cheese. I use the same method for cream cheese frosting, up until the paper towel which would stick to the frosting. I read more of the comments that other people left after I left the comment to you and found that you’d already answered this question before. I felt bad then. Thanks so much for getting back to me. Really love your blog. Looking forward to more tutorials! so good instruction. But are all these tools really necessary? Can you provide More accessible alternatives ? These are the tools I settled on after trying many. I find them to work best to give the best result. As far as this tutorial is concerned, they are the ones I recommend and would deem “necessary” so to speak. They should be pretty accessible, for the most part. I’ve provided Amazon links, but many of the Wilton products can also be found at craft stores like Michaels and even Walmart. The Ateco products are usually also available in stores at Sur la Table. Learnt so much from this tutorial along with all the comments. thank you from zambia! Great video and pictures! I hadn’t tried the very fat nozzle for the sides before, and had only used a (hot) offset spatula. But the fat piping nozzle is obviously the way to go when you’re striving for smoothness. My question is actually about something different: you seem to be using some sort of platform on top of the cake turntable. One really wants such a thing, unless you’re going to serve the cake directly off the turntable, since removing the cake from the turntable is a very tricky (and messy, at least for me) job. You didn’t mention what these platforms were, and I wonder if they are easily available? Glad you enjoyed the tutorial. The cake is sitting on a cardboard cake circle. How does the frosting not stick to the paper towel? It’s all about having the right frosting consistency. Thank you so much for this tutorial Lindsay. I have added a link to it on my baking blog so that readers can learn from you! Hi Lindsay, Thanks so much for these instructions on the perfectly iced cake. But, I do have a question also my family love swiss buttercream which works great under fondant that I never use. But it isn’t a crusting recipe can you use the paper towel with it? Also I bought all the tools from your link and was wondering how you put that large tip into a bag and what size bag, and do you have to use a disposal bag for it? If so, how much would you trim it off so the icing doesn’t come out the sides of the bag, I seem to always cut the disposable bags to much with larger tips and my frosting comes out of the sides of the tip. Your cakes look beautiful by the way. I am doing my grandsons cake tomorrow for his 21st birthday so it has to be perfect. I hope you read comments still from older post so I can use this method on his cake tomorrow. And he has specifically requested your best chocolate cake that I made for my daughter in Nov. He said after eating a slice of hers. That I should open a bakery lol. She loved the frosting he couldn’t stop talking about your cake how great it tasted and I have to agree. Thanks so much Faye! I hope you continue to enjoy the site and recipes! how many batches of cake recipe did u make for a tall cake like that? It’s just one cake recipe of this cake. Wonderful tutorial, Im just curious as to why a paper towel instead of parchment paper? It’s a very specific paper towel – the Viva. It’s the only smooth paper towel that I’m aware of. Parchment paper becomes an issue if it wrinkles up and transfers those wrinkles onto the cake. Thank you so much for this! I made your cherry chocolate chip cake yesterday and was so frustrated with my lack of frosting abilities… blah. All in all it was fine but I want to be able to achieve a nice, smooth cake. I never have seen these tips before so thanks so much!! Looks beautiful. Awesome! I’m so glad you found it to be helpful! wow nice one ………how come your butter icing sugar is thick ? That’s a lot of work and time. 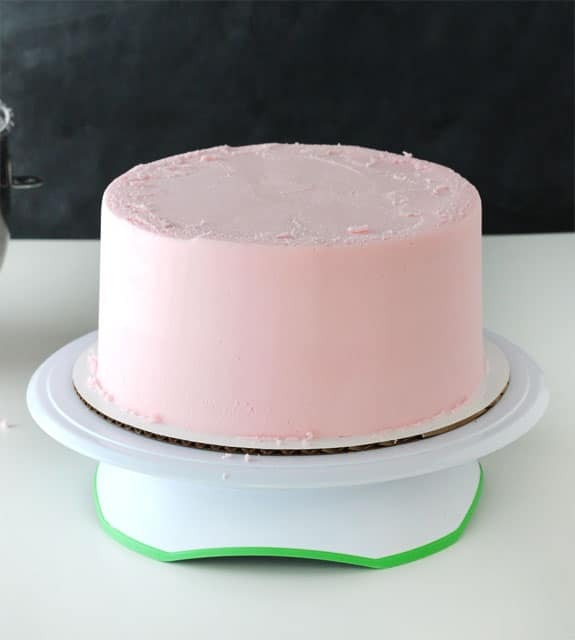 With acrylic icing guides you can skip the crumb coat and paper towel smoothing, which is unhygienic, and create flawlessly smooth iced cakes in 5 mins. Food safety and hygiene mandates the only tools that come in direct contact with food are tools that can be sterilized. Great tutorial! This is a valuable information for newbies like me…Thanks! I just wonder if I really need to use the tips you suggested (the Ateco 844 and Wilton 789)? I already have a high quality decorating tip set (Chefast brand) that I just bought on Amazon. I think the tips 47 and 17 included in the set are similar to those tips you mentioned… Can you tell me if those tips I mentioned are ok to use for smoothing a cake? If you have other similar tips, they should be fine. I did a quick google search of those tips, but couldn’t find a picture of them. I’d check out the Wilton ones and see if they look similar to yours. do you have to put the cake in the fridge before using the paper towel? everytime i have done this, my icing peels off? No, I actually wouldn’t refrigerate it or let it sit first or the buttercream will crust and then you won’t be able to use the paper towel to fix imperfections without actually creating more imperfections. If the paper towel is sticking, it’s because of the frosting consistency. It it’s too thin or sticky, it will stick a bit. Feel free to check out my post on frosting consistency. The best tutorial ever! Your a natural teacher! It helped me a lot! Well done!! Thank you Beth! I’m so glad the tutorials are helpful! 2 questions: 1) does this work as well with meringue buttercreams? I strongly prefer something less sweet, and would love to find a way to get the same texture on something a little lighter. 2) do you have any advice about the temperature of either the icing or the cake? I’ve had to mess with both in the past to get decent smoothness. This method will work with meringue buttercream up until the paper towel part. Meringue buttercream is probably going to stick to the paper towel. I typically frost a room temperature cake with room temperature buttercream. I’ll occasionally refrigerate the cake after the crumb coat but only if there is a thin filling between the layers, like lemon curd. “Thank You” doesn’t begin to convey my gratitude for this tutorial. Working slowly with explanation as you go is a priceless gift to bakers. I needed to learn to slow down. The cake won’t age by me taking my time and with your guidance, I take control, the cake doesn’t! You’re a gem…. with a lifetime follower. And thank you for the most awesome recipes! Thanks Marian! I’m so glad the tutorials are helpful and that you are enjoying the recipes! What type of icing bags do you recommend? Are there different bags for different tips? I typically use Wilton brand piping bags, which are easy to find in Michaels, Hobby Lobby or Walmart. The 12 inch bags are good for smaller piping things (like little borders or decorations) and 16 inch bags are best for piping onto cupcakes or frosting the side of the cake, as shown in this tutorial. I often get reusable bags, but disposable ones are also available. 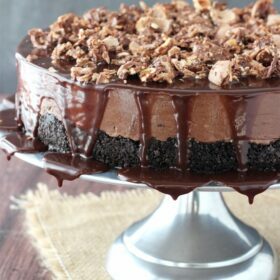 Hi, do you have a crumb coat tutorial? this is a very educative tutorial. but I have a question. which is; is paper towel the same thing as baking paper? I assume by baking paper you mean parchment paper and no, they aren’t the same thing.